Construction carried out this past summer included renovation of the school’s interior, replacement of its inefficient windows and doors, and new floors. The school cafeteria and technology classroom, sports grounds and bathrooms had been previously renovated and refurnished through BCPP. Berd #3 kindergarten, which is adjoined to the primary school, was also previously redone. While other schools in Berd have received extensive renovations, Berd #4 is the first to have its entire facility completely revamped through the support of BCPP. 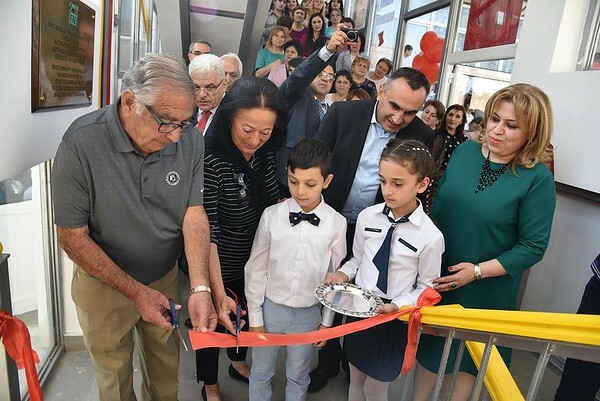 The Mardigian Family, generous benefactors of BCPP, attended the official opening ceremony, along with the school’s 155 students, school staff and other guests. “We chose the Berd #4 school for such extensive renovations because it’s on the isolated southwestern part of Berd City, and was in worse condition than all the other schools in the area. We want to provide good educational conditions to all schools in Berd, both rural and urban,” said FAR Education and Science Programs Director Eduard Karapetyan. Principal Anahit Abgaryan said that the school had not been renovated since it opened 25 years ago, and it really needed the improvements. “Our beloved school looked pretty bad and that affected the number of students we had since parents usually choose to send their kids to schools in better condition. Now, things will change. The number of students will definitely increase and they will learn in a more beautiful, enriching environment,” she said.